JACKSON HOLE, WYO – A beloved moose that has made a habitat homebase of Highway 390 near the junction with Wyo22 is dead after a late-night collision last night. Even more tragic, the large cow that has become a familiar sight in the area, had a calf in tow that has also been killed. The cow moose had done a pretty good job of staying out of the road for more than a year now. Residents of the neighborhood have all had the animal browsing their bushes at some time of another. Photos and videos of the mother and calf abound on social media. With her newborn missing, perhaps the mother moose became distraught and briefly abandoned her usual cautious behavior about being in the road. That’s all speculation, of course. Tragedy struck Saturday night at 9:50pm when a local taxi driver struck and killed a moose calf. Highway Patrol responded. Wyoming Game and Fish later came and remove the carcass. The fact is, dispatch received yet another call about 24 hours later. A collision at approximately 11pm broke the back of the cow moose. Several passing motorists watched as she struggled to rise from the road again and again. She was dispatched shortly after authorities arrived at the scene. Both mother and baby are now gone. 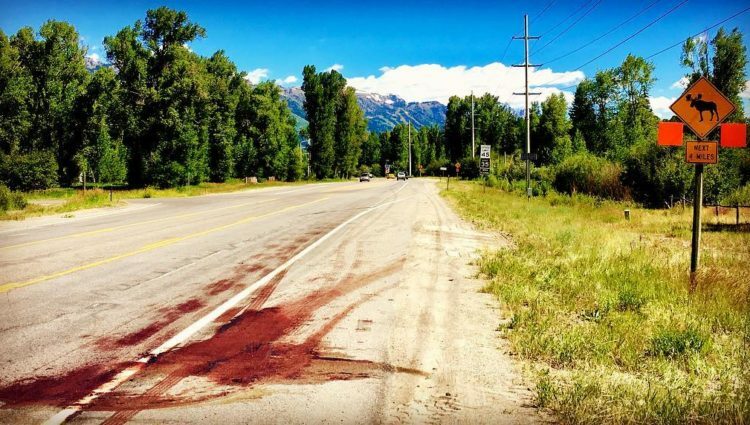 The stretch of Highway 390 (Teton Village Road) has been especially deadly for moose. Some 40 moose have been recorded killed by motorists since 2010. Nighttime speed reduction from 45 to 35 mph, along with moose silhouettes and added signage, have helped reduce the number of conflicts in recent years. The West Bank area along the Snake River from Highway 22 junction to Teton Village is prime habitat for moose and many other species of wildlife.